After the success (or whatever you want to call it) of Lifetime’s The Unauthorized Saved By The Bell Story, the network quickly started moving forward with three follow-ups: The Unauthorized Full House Story, The Unauthorized Beverly Hills, 90120 Story, and The Unauthorized Melrose Place Story. 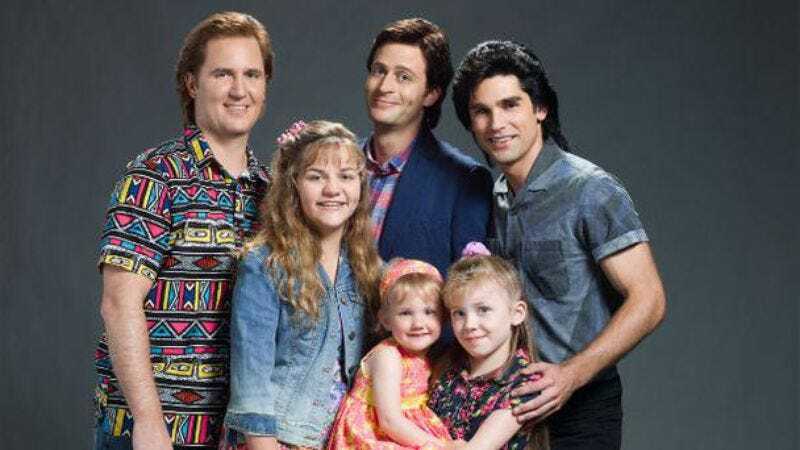 We haven’t seen or heard much about the latter two, but Lifetime has already graciously released a horrible cast photo for the Full House movie, and now we have the first clip as well. Sadly, the clip—which you can see below—is pretty light on the sort of scandalous reveals you might expect from a TV movie like this. But it does give us a chance to see some actors do reasonably tolerable impressions of Bob Saget, John Stamos, Dave Coulier, and Jodie Sweetin. Basically, all it tells us is that Stamos thought working with babies was hard and that Saget liked to make mildly inappropriate jokes, niether of which are especially shocking. One surprising twist, though, is that apparently the eponymous house in Full House actually had the front door on the right side of the screen instead of the left. Was it digitally reversed in post? Either way, our minds are blown. The Unauthorized Full House Story will premiere on Lifetime on August 22.